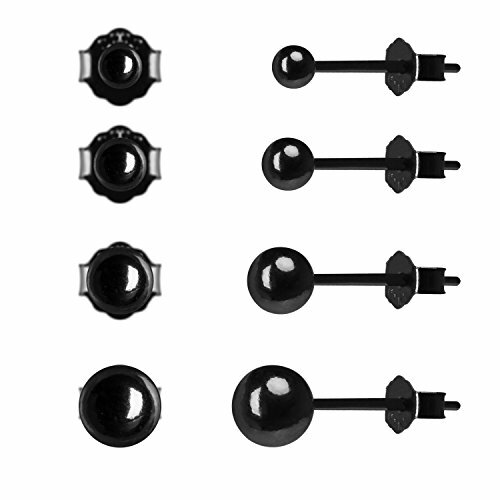 Sterling Silver Ball Stud Earrings Set (Black, 4 Pairs-2mm 3mm 4mm 5mm) by Gintan at The Bling Tree. MPN: EB01-B. Hurry! Limited time offer. Offer valid only while supplies last. .925 Sterling Silver: hypoallergenic, great for sensitive ears. 4 Pairs/Set: 2mm-5mm, perfect for those who have multiple ear piercings. High Polished Surface: won't scratch your ears, comfortable to wear. If you have any questions about this product by Gintan, contact us by completing and submitting the form below. If you are looking for a specif part number, please include it with your message.